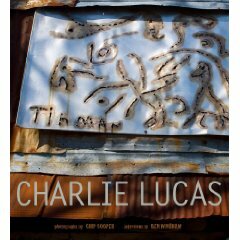 Charlie Lucas is a self-taught artist. Although he has made art since childhood, only since a debilitating accident in 1984 did Lucas turn to art seriously as a form of personal expression. He has since become recognized nationally and internationally as a great innovator in the field of American folk art. From his workshop in Pink Lily, Alabama – a rural wonderland of objects, sculptures, paintings, buildings, and installations – Charlie Lucas makes his art from materials that others have discarded (as he himself believes he was once discarded): old tin, bicycle wheels, shovels, car mufflers, tractor seats, metal banding, wire, and gears. His work is visionary, in every sense of the word, each creation the result of an intense communion with his heritage, ancestors, race, family, and his own choices in life. Every work is imbued with a story. With more than 200 vivid color photographs – of the artist at work, his studio environments, and his finished creations – “Tin Man” presents Lucas through his own words and stories – his troubled and impoverished childhood, his self-awakening to the depths of his own artistic vision, his perseverance through years of derision and misapprehension, and the salvation that has come through international acclaim and recognition, love of family, and his role as a teacher of children. (source). Tin Man is being released in October by University of Alabama Press.